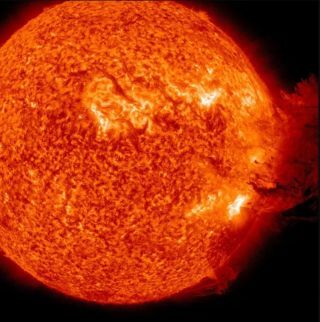 NASA engineers are one step closer to understanding the "crown" of the sun. In photographs of total solar eclipses, the ethereal halo an observer sees is the sun's corona. The word means "crown" in Latin and Spanish, but the beauty of the name masks a scorching reality: 500 kilometers from the sun's visible surface, coronal temperatures can reach a few million degrees. According to NASA officials, engineers added a heat shield eight feet in diameter to the Parker Solar Probe spacecraft on June 27 to keep the instruments at the "relatively comfortable temperature" of 85 degrees Fahrenheit (29.4 degrees Celsius). The mission is scheduled to launch in August 2018. The Parker Solar Probe's goal is to explore how the sun directly affects life on Earth, according to NASA officials. The Johns Hopkins Applied Physics Laboratory designed, built and and manages the mission, and will also operate it. Parker Solar Probe is part of NASA's Living with a Star Program, which is managed for the Heliophysics Division of NASA's Science Mission Directorate in Washington, D.C., according to the agency. Parker Solar Probe's heat shield, called the Thermal Protection System, is lifted and realigned with the spacecraft's truss as engineers from the Johns Hopkins Applied Physics Lab prepare to install the 8-foot-diameter heat shield on June 27, 2018. No human-made object has ever gone as close to the sun as this mission plans to go, and if the Parker Solar Probe succeeds, it will travel to within 4 million miles (6.4 million kilometers) of the sun's blazing surface, where temperatures reach 2,500 degrees F (1,371 degrees C), NASA officials said in the statement. The probe's heat shield is called the Thermal Protection System. NASA officials said that it's made of a 4.5-inch-thick carbon foam core that is 97 percent air and extremely lightweight. It sits between two panels of superheated carbon-carbon composite. And the side of the heat shield that will face the sun is sprayed with a special coating to reflect the star's energy away from the spacecraft. Parker Solar Probe's heat shield is made of two panels of superheated carbon-carbon composite sandwiching a lightweight 4.5-inch-thick carbon foam core. To reflect as much of the sun's energy away from the spacecraft as possible, the sun-facing side of the heat shield is also sprayed with a specially formulated white coating. And there's a good reason the heat shield must be lightweight: "Because Parker Solar Probe travels so fast — 430,000 miles per hour [692,018 km/h per hour] at its closest approach to the sun, fast enough to travel from Philadelphia to Washington, D.C., in about 1 second — the shield and spacecraft have to be light to achieve the needed orbit," NASA officials said in the statement.